Are you expanding your home, building a new home from scratch, or remodeling the outside of your current house? If so, you may be turning to vinyl siding as a solution for covering the exterior of your home. Stone, brick, and even wood are expensive options for covering the outer walls of your residence, but vinyl siding is affordable, while offering you the durability and protection you need in order to weatherproof your home. One helpful tool in creating awesome color combinations is the color wheel. The color wheel positions complementary colors across from one another. Blue and orange are opposites; yellow and purple are opposites; red and green are opposites. Consider using the color wheel to coordinate the colors of your vinyl siding and simultaneously giving it some pop. If you’re looking for a house that tactfully stands out, or you live in neighborhood with colorful homes (this may be more predominant in tropical areas), why not pair opposite colors to vivify your home’s exterior? For example, blue siding would be well paired with orange trimming around the doors, windows, and gutters. Purple siding would be complemented by yellow trimming, and green would look great with the highlights of red trimming. You may feel like getting a little creative with your color pairings, and that’s fine. Just make sure to avoid using too many, otherwise your house will look too busy, unless you’re specifically going for a hodgepodge, eclectic effect. Also remember that when you stick to the complementary pairings suggested by the color wheel, you’ll maximize the curb appeal of your siding. Another method of picking color combinations involves using color schemes with more than two colors. Hot, cold, pastel, and earthy are a few different commonly used color schemes, but the basic premise of these four involves using color combinations from the color wheel that are analogously positioned (meaning side to side). For example, green, blue, and purple are “cool” colors, while red, orange, and yellow are “hot” colors. As the name implies, cool colors connote elements like air and water, which generally are at lower temperatures, while hot colors imply the heat of fire. Pastel color schemes are merely formed by “dulling” or “softening” each of the color arrangements with white, while “earthiness” is implied by adding grey, black and sometimes white. For those who want to get really creative, the color wheel also offers other arrangements of color such as triadic, split-complementary, rectangular, and square, each one formed by making geometric connections between colors along the color wheel. If you’re considering using multiple colors on your home, consider meeting with a painter, designer, or expert in this area to lay out a color wheel and select some options. You can also check out a free color wheel and color selection tool at color.adobe.com to see what color combinations you can come up with. A big part of the color selection you make should be dictated in part by your desire to conform or stand out from the homes around you. 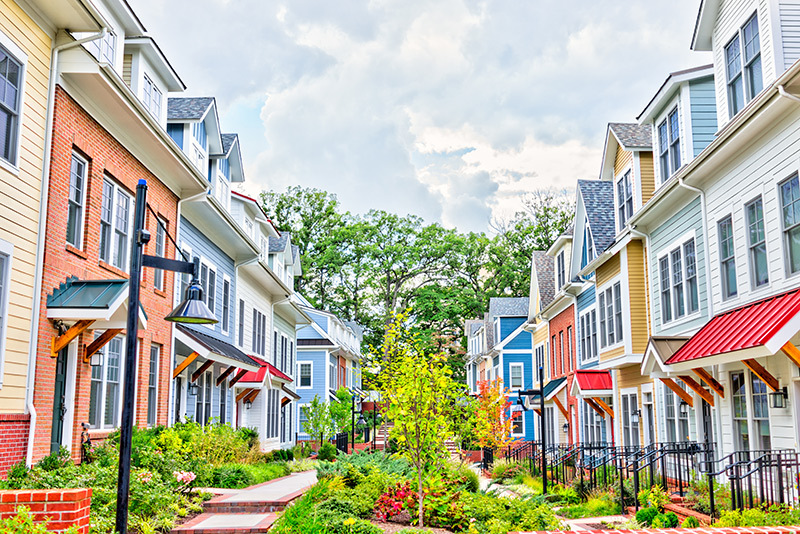 While it’s true that in suburbia, the majority of homes show great continuity and regularity throughout multiple developments, there are regional differences across the country. For example, homes in tropical locations tend to utilize bright colors, or the earthiness implied by the adobe of Spanish colonial architecture. Homes on the Eastern Seaboard tend to use a lot of brick, while there are also variations that utilize wood siding or locally quarried stones. Mountain homes may be made of roughly hewn wood, shingles, or rugged stone. If you’re looking for some inspiration about how to treat the façade of your house, consider driving around your neighborhood and seeing what other people are doing. Also drive around the greater context of your neighborhood, such as the downtown or historical areas, to see what type of stylistic elements people have utilized in the past. Another consideration to analyze is the style of your home. Does your house have a more traditional shape with a hip or gable roof? Is the layout symmetrical or asymmetrical? Is your home more modern-looking with a flat roof? The shape and style of your home may suggest a particular type and color of vinyl siding. For example, if your home is shaped like a double-storied rectangle with a gambrel roof, you may appreciate red siding that complements white trimming, drawing inspiration from the classic American red barn. If you’re home is comprised of a simple series of squares arranged in a mostly symmetrical layout, you may appreciate a conservative pattern of stone, bricks, or shingle vinyl siding. On the other hand, if your home looks like a futuristic explosion of shapes that are totally asymmetrical, textured siding can make it look too busy. You might want to go with a simple two or three color scheme arrangement of solid color vinyl siding. If you’re remodeling a part of your home, or adding a new wing, you may find that vinyl siding is an affordable option to continue the continuity of your home’s appearance. For example, let’s say ten years ago you bought a home with actual wood siding. Now you want to break down the kitchen wall, expand the kitchen, add a breakfast nook, and add a second story with a bedroom and a guestroom above all of that. Sounds like that expansion is going to add up, doesn’t it? When you look over the budget and compare it to your available credit or available funds, you may find that covering all of the new exterior with the same type of natural wood siding of the original structure is out of your price range. Vinyl siding can provide a great solution to this issue. In this case, you may want to keep the continuity of your color original color scheme, and pick vinyl siding that matches this color. A somewhat recent trend in the design of newer homes has been to get creative with the façade, and mix and match materials, giving it a classier, more sophisticated look, without getting too confusing. In this case, you may consider mixing the vinyl siding option with other textures and materials on the façade. For example, you could ring the bottom of your home in actual stone or brick, and complete the upper portion of the walls with vinyl siding, giving your home’s exterior an intriguing combination of materials and textures. This option can also provide a realistic compromise if you, your architect, or designer is adamant about incorporating authentic materials into the appearance of the home, but your budget won’t allow for you to totally cover the walls in quartz. Just remember that when you pair vinyl siding of a particular color, make sure it goes with the color of the other materials you’re using. For example, if you’re using dark grey stonework, where each stone is differently shaped, you may want to compliment the emphasis on natural appearance with an earthier tone of green or brown. If you’re using red brick, which implies more uniformity, consider complimenting that brickwork with a more traditional white, while if the bricks are whitewashed, a light blue could look best. There are a variety of siding combinations when it comes to color, style, and texture, but the color wheel won’t let you down, and you find excellent inspiration in the styles and location of your home. Get creative and enjoy the process, because when the siding is up, you’ll be able to enjoy a great looking home.